Scientists and researchers have been busy finding the best treatment for acne. Acne is a skin condition that causes pimples or "zits." These are spots that results from excess oil getting trapped in the skin pores which results in blockages, infection and build up of bacteria. Recent studies have shown thyme as an effective treatment as well as a combined therapy of Epiduo Gel and Doxycycline. Another promising drug that is both natural and inexpensive is lauric acid found in coconut milk. Lauric acid is a saturated fatty acid, specifically a medium chain fatty acid because of its 12 carbon atom chain. It is mainly found in coconut oil, laurel oil, and in palm kernel oil, comprising more than 50% of the fatty acid content in these oils. Lauric acid is a white, powdery solid with a faint odor of bay oil or soap. It can also be found in human breast milk, cow's milk, and goat's milk. It has antiviral, antimicrobial, antiprotozoal and antifungal properties when present in the hyman body. Because of these properties, lauric acid is being studied as a possible new acne treatment. Common acne (acne vulgaris) afflicts around than 85 percent of teenagers and over 40 million people in the United States, including adults. Current acne treatments have unwanted side effcts that include redness and burning. Because of the inherent properties of lauric acid, these could be avoided. 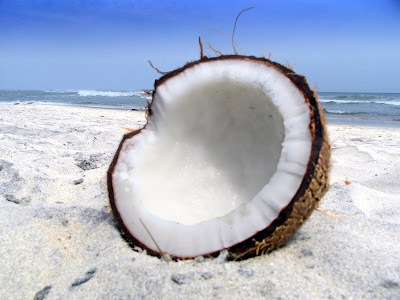 University of California San Diego are researching coconut oil treatments for acne. Using gold nanoparticles, the delivery system delivers lauric acid filled nano-scale bombs directly to skin-dwelling bacteria (Propionibacterium acnes) that cause common acne. It works by having the nanoparticles attach to the nano-bombs, artificially-prepared vesicles that are used as a vehicle for administration of nutrients and pharmaceutical drugs called liposomes. The gold nanoparticles keep the liposomes from fusing together (releasing its payload) and help locate the acne-causing bacteria. Once the nano-bombs reach the bacterial membranes, the acidic microenvironment causes the gold nanoparticles to drop off. This frees the liposomes carrying lauric acid payloads to fuse with bacterial membranes and kill the Propionibacterium acnes bacteria. "Precisely controlled nano-scale delivery of drugs that are applied topically to the skin could significantly improve the treatment of skin bacterial infections. By delivering drugs directly to the bacteria of interest, we hope to boost antimicrobial efficacy and minimize off-target adverse effects," said Zhang. "All building blocks of the nano-bombs are either natural products or have been approved for clinical use, which means these nano-bombs are likely to be tested on humans in the near future." Zhang noted that nano-scale topical drug delivery systems face a different set of challenges than systems that use nanotechnology to deliver drugs systematically to people. Pornpattananangkul and UC San Diego chemical engineering undergraduate Darren Yang confirmed, in 2009 in the journal Biomaterials, the antimicrobial activity of nano-scale packets of lauric acid against Propionibacterium acnes. Pornpattananangkul, who is originally from Thailand, said that it's just a coincidence that her research involves a natural product produced by coconuts – a staple of Thai cuisine.